Prestigious Fires works closely with architects, home builders, hotels & restaurants and with home owners. Prestigious Fires craft some of the most exclusive fireplaces and outdoor fire centrepieces in the world. For millennia, fire has played a central role in the home, keeping us warm and when night descends, fuelling our passion. It possess ethereal qualities unlike any other element, drawing ones gaze in deeper as the flames flicker and dance. It is both destructive and creative. Safety and quality are our primary focus and we only feature products that we have personally tested and have also been tested by a respected safety authority (e.g. TUV). Taking inspiration from around the globe, our exclusive outdoor range elevates outdoor fires to levels of beauty and precision that can't be found elsewhere. Our passion for design and knowledge of manufacturing and materials combine in perfect harmony to deliver products where every detail is considered. With cold rolled steel, ingenuity and meticulous attention to detail, we have tamed its destructive nature and harnessed its energy to create a stunning collection of unique outdoor fires unlike any seen before. Working alongside our designers, our bespoke fire service empowers the ability to create one-of-a-kind centrepieces, built to your exacting requirements and our exacting standards. Consulting you throughout the process, what starts with a sketch is crafted into your unique fire. Prestigious Fires has been a recognised name in the UK fireplace industry since 2007. We pride ourselves on innovation and were instrumental in introducing bioethanol fires and bioethanol fuel into the UK. Where we once focused on bioethanol fires, we’ve now built a beautiful range of luxury outdoor gas fires. Our outdoor fires are truly unique and unlike anything else available. 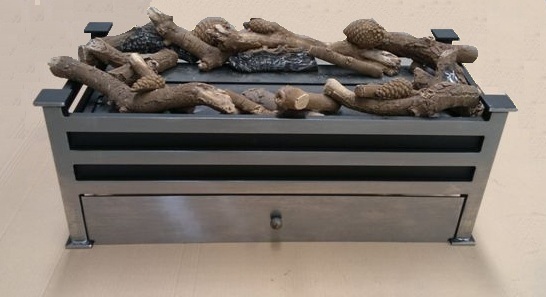 We specialise in outdoor fire tables and have placed these exclusives fires in restaurants, bars, retailers and hotels. Outdoor fires have been popular in the USA for decades and their popularity is growing rapidly here in the UK. However, American gas fire pits are rarely CE approved and so can't be imported and used in the UK. All our outdoor fires are CE approved and go through rigorous safety testing.